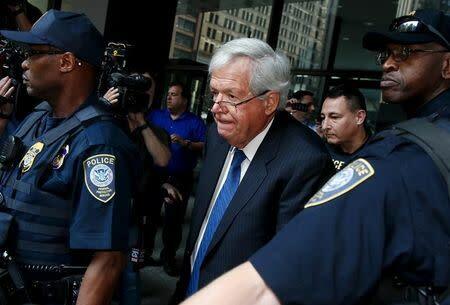 Hastert, 73, pleaded guilty to one count of "structuring" - withdrawing funds from bank accounts in amounts below $10,000 to evade bank reporting rules on large cash movements. Those rules exist to detect money laundering. "I didn't want them to know how I intended to spend the money," he said, reading from a brief statement during a hearing in the federal courthouse in Chicago that lasted a little over 20 minutes. In the agreement, Hastert admitted to paying $1.7 million in cash to someone he had known for decades to buy that person's silence and compensate for past misconduct toward that individual. Hastert, flanked by two attorneys, stood before the judge and answered a series of questions to indicate that he understood what he was doing. He spoke loudly and clearly at the judge's request. "I think it's a really good outcome, from a defense perspective," said Amy Richardson, with the firm of Harris, Wiltshire & Grannis. "This is one more time where a person with power and authority gets to keep dirty secrets hidden," said Barbara Blaine, founder of SNAP, an advocacy group for survivors of clerical abuse. After his indictment, Hastert resigned from the Dickstein Shapiro lobbying firm in Washington, D.C., and from the boards of exchange operator CME Group Inc and REX American Resources Corp .